Robin van Persie accumulated two yellow cards in his two games of World Cup 2014, Arjen Robben become Der Oranje captain in their last match against Chile. The Netherlands struggle to win the match because Chile fought very hard as they showed last match against Italy. Until minute 77th Der Oranje with Robben assist L. Fer could scored the first goal, next in minute 90th again Robben give assist to lead to goal this time M. Depay who scored. 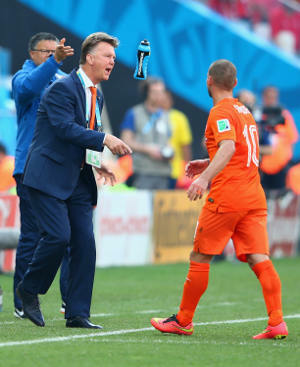 Louis van Gaal admitted to the press after the game that he is not fully satisfy by The Netherlands performance. Transition from 5-3-2 when opponent attack to 4-3-3 when the Netherlands attacking was progressing smoothly in the game. However van Gaal also noted there will be improvement for the team tactics. are this scheme will eventually applied to Manchester United sir?